All I can say is that my Spanish wasn't very good when I was eight years old. I always thought that 'Que sera mi vida' meant 'How are you, I'm okay', but it actually means 'How would my life be'. Oh well, lessons learned. This disco hit sold over five million copies worldwide. The single reached number 5 in the UK singles chart and number 3 in the Dutch Top 40. 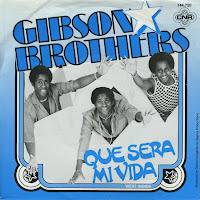 When I was six years old, I idolized the Gibson Brothers. They had a number one hit in the Netherlands with 'Non stop dance' in May 1977, and their performances in Seventies disco clothing were probably very interesting for young viewers like myself. The three brothers Chris, Patrick and Alex were born on Martinique in the West Indies. They debuted in 1976 with the single 'Come to America'. 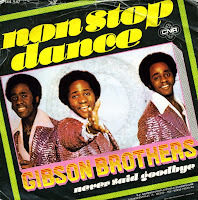 The second single, 'Non stop dance' was a hit all over Europe. I bought a rather dusty copy of this single, but a simple washing up helped clean this record.